Premium quality absorbed glass mat technology (AGM) is ideal for ATVs, motorcycles, personal watercraft, & snowmobiles. The Big Crank Power Sports AGM Battery was designed for more than performance; it was designed for the enthusiast. Completely spillproof and leakproof; frequent replacement and high maintenance are over! The AGM technology increases power while improving rider and environmental safety. The key to this technology is the highly porous microfiber separators, which completely absorb and trap the electrolyte. Molded top and side connection terminals provide versatility, increased strength and durability. 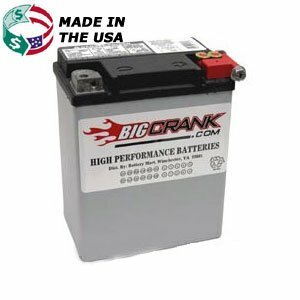 The Big Crank Power Sports AGM Battery provides the most advanced power and value in the industry. 14 Ah @ 10hr rate 210 CCA Replaces: YB14L-A1, YB14L-A2, YB14L-B2, 12N14-3A, SYB14L-A2, SYB14L-B2 ETX15L equivalent Features: Sealed, Maintenance-Free Leakproof/Spillproof Ships fully charged ready to install Environmentally friendly, 100% recyc lable Vibration Resistant Design Fully Charged out of the box Made in the USA New bolts included Note: Please check dimensions and terminal configuration to ensure this is the proper battery for your application. Off-Season Maintenance : We recommend the charger below to maintain this battery when it is not in use. I used this battery in my 1984 Honda Nighthawk 700s and it instantly inproved the starting ability. I have had no issues with this battery. It starts so much easier since I put this in. Solid state batteries are the way to go. I reccommend this to anyone looking for a reasonable and reliable battery. This is my first ever product review, I just wanted to recommend this battery to anyone who is interested. Rugged, solid construction and a perfect fit in my 2004 KLR650 (53k miles) that had been slowly killing its previous battery. The bike fired right up after installing this battery, the quickest and strongest start I've heard from it. An added bonus is that the package includes nice new bolts that you can screw directly into the terminals, no more messing with the tiny nut inside the terminal that manages to disappear every time you mess with it. The fact that it is AGM and you never have to mess with water refills (like anyone ever does anyway) makes this the perfect investment. The standard rechargeable lead-acid battery was invented in 1859, isn't it time your bike was powered by something a little more modern? I have a 1982 Honda Sabre that has always been hard on batteries. This one works the best, hot or cold start.